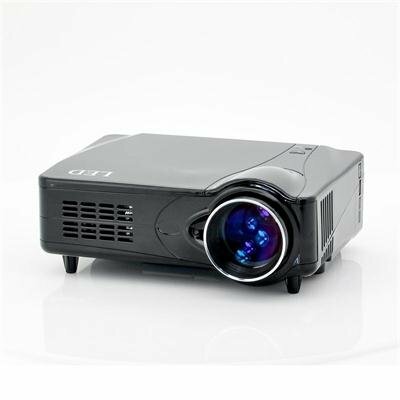 Successfully Added LED Multimedia Projector - 800x600, 2200 Lumens, 600:1 to your Shopping Cart. LED Multimedia Projector featuring a sleek, sophisticated design and cutting edge LED technology; this LED multimedia projector is a perfect choice for both work and play. 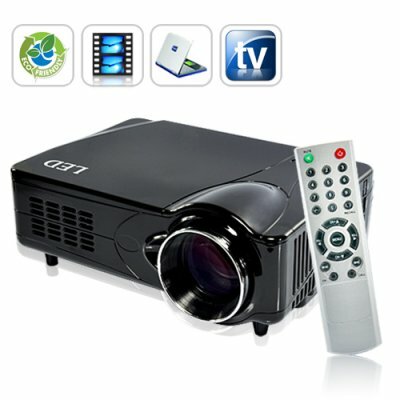 Brand new LED Projector used in any number of settings such as offices, conference rooms, classrooms, living rooms, etc. You can input HDMI, VGA, SCART, Composite and Component AV devices, into this LED Multimedia Projector and start viewing them in big screen comfort. With a resolution of 800x600, this LED projector will ensure that all contents is easy to see and is clear as can be as well with a 600:1 contrast. Also, with a brightness of 2200 ANSI Lumens, this means the quality of the display that is projected is strong and clear. It offers up to 50,000 hours lamp life, which means that it can last for more than 30 years if running at 4 hours a day. Additionally, because LEDs stay cool, you can turn off the projector and pack it up without having to wait for the lamp to cool down first. Compared to other projectors on the market, this product is ultra silent as it operates with a fan noise of only 25db, which is the same as a high quality laptop. This translates into less distraction during presentations, or when viewing movies or playing games. The LED light source delivers a wider color-range and deeper color-saturation than traditional lamps and provides clear, crisp images for any type of media from videos and TV to PowerPoint and Excel files. This LED multimedia projector with 2200 ANSI Lumens is a great alternative to use instead of the regular monitor and can produce large and high quality displays. Order today and we will express ship it out to you tomorrow with a 12 month warranty. Brought to you the leaders in electronic devices and LED projectors, Chinavasion. pour tout ceux qui aurait des doutes sur le serieux de chinavasion, vous pouvez franchement y aller, moi c'est mon 4 achat sur ce site et tout est impeccable!!!! I'm from Suriname. I was sceptical, but after testing I was amazed, about de quality of the display and the ease of operation. the delivery time was after payment was exceent. My compiments to Chinavasion . I strongly reccomend Chinavision for buying online products. For Chinavision I suggest expand the range of your products. I bought one for my client, but tested it overnight. I made our wall a giant TV and just feel inlove with this one, HDMI, AV and VGA connections work perfectly. Sound is good too on the built-in speaker. But if you want to have a real multimedia experience attaching one to a robust speaker can turn your home into an instant cinema. I'm saving my income to buy one of this. Simply amazing. I bought one and it is great. doesn't heat up at all and the pictures are crisp and clear. good buy.